ODC Marine is a French-own company located in China’s port city of Dalian that specialises in the production of aluminium vessels for the leisure and commercial industries. 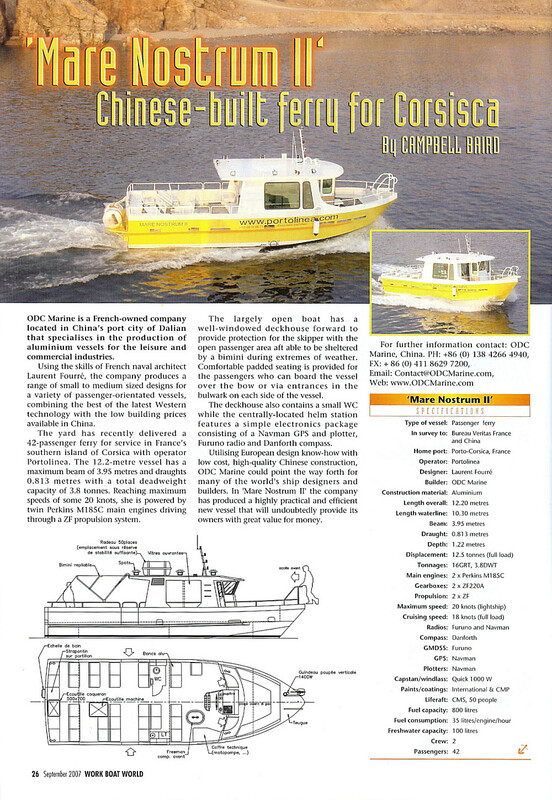 Using the skills of French naval architect Laurent Fourré, the company produces a range of small to medium sized designs for a variety of passenger-orientated vessels, combining the best of the latest Western technology with the low building price available in China. The yard has recently delivered a 42-passenger ferry for service in France’s southern island of Corsica with operator Portolinea. The 12.2-metre vessel has a maximum beam of 3.95 metres and draughts 0.813 metres with a total deadweight capacity of 3.8 tonnes. Reaching maximum speeds of some 20 knots, she is powered by twin Perkins M185C main engines driving through a ZF propulsion system. The largely open boat has a well-windowed deckhouse forward to provide protection for the skippper with the open passenger area aft able to be sheltered by a bimini during extremes of weather. Comfortable padded seating is provided for the passengers who can board the vessel over the bow or via entrances in the bulwark on each side of the vessel. The deckhouse also contains a small WC while the centrally-located helm station features a simple electronics package consisting of a Navman GPS and plotter, Furuno radio and Danforth compass. Utilising European design know-how with low cost, high-quality Chinese construction, ODC Marine could point the way forth for many of the world’s ship designers and builders. In ‘Mare Nostrum II’ the company has produced a highly practical and efficient new vessel that will undoubtedly provide its owners with great value for money.